Files and folders protection using strong encryption by password and key file. Certification and signature of files. Data protection against the theft of computers, mobile media, backups, illegal access to a computer, intrusions on networks, spyware and viruses of all kinds, misappropriation of files transmitted by email. 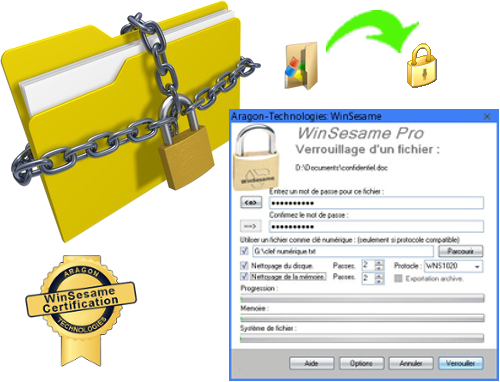 WinSesame uses 6 algorithms including the new WNS1040 lost key symetric encryption algorithm with no key length limitation using the latest technologies in cryptography. This algorithm is the most powerful currently available and allows password plus key file encryption without length limit. The software is self-protected against any risk of executable code attack. Send encrypted files to a correspondent without having to install the software on his computer. For the transport of mobile media containing confidential data, it is sometimes preferable not to highlight the presence of encrypted files by hiding them behind photos. Sign and certify the files you send or make available for download. Your correspondents can check the integrity of the files received before open. Check the integrity of your files stored on the servers, cloud etc. Professional tranquilize your customers by a secure communication. Double encryption of files and folders by password plus key file. Exporting encrypted files or folders to self-extracting archives. Hiding encrypted files or folders behind photos. Verification of WinSesame Certification signatures. Signature storage space available on the WinSesame Certification server. Possibility of using a WinSesame Certification Plus account. Permanent license for life can be reactivated in the event of a computer change.